Hormones and the body's immune system are interconnected. It's no wonder, then, that when the female body goes through hormonal transitions - such as during puberty, menstruation, pregnancy, and menopause - allergies can become worse or newly appear. As women approach menopause, many begin to experience a heightened sensitivity to allergies that previously had only subtle effects, or new allergies might spring up seemingly out of nowhere. Therefore, it's important to understand allergies in relation to menopause, their causes, and different the treatment options available. Continue reading to learn all about allergies during menopause. Allergies are present when a person's immune system reacts abnormally to foreign substances that are typically harmless to most people. Perhaps the most common example is an allergy to pollen. In this case, pollen would be known as an allergen. When a person is allergic to something, the immune system mistakenly identifies the substance as harmful, and in an attempt to protect the body, produces a type of antibody at the source of an allergic reaction, known as an IgE antibody. These antibodies spark chemical reactions in certain cells, namely the release histamine into the bloodstream. Many people, especially allergy sufferers, are familiar with histamine, which is the compound that inflames tissue and is responsible for runny noses, sneezing, rashes, and other symptoms of an allergic reaction. For those with allergies, histamine becomes part of an allergic response that can range from relatively minor symptoms to life-threatening, full-body reactions. Because there is such a wide array of allergies different people can have, the symptoms vary as well. Allergy symptoms can range from mild to severe, and some allergies can cause multiple symptoms in an individual. An extremely severe allergic reaction is called anaphylaxis. Although anaphylaxis is rare, if not treated, it can cause very serious health concerns or even death. 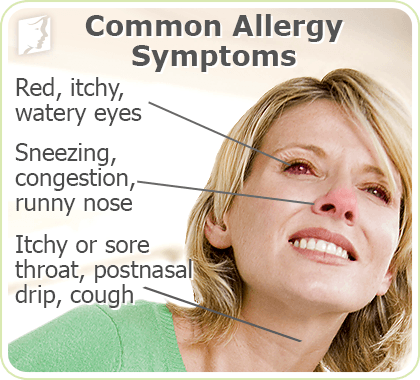 Below are allergy symptoms, separated into mild, moderate, and severe. One recent study determined that perimenopausal women who'd not had their periods for six months experienced an 80% increase in respiratory symptoms associated with asthma compared to those who were menstruating regularly. Hay fever. This is the most common allergic reaction and refers to seasonal nasal symptoms that are due to pollen. Asthma. This is a breathing problem that results from the inflammation and spasm of the lungs' air passages. Allergic eyes. This is inflammation of the tissue layers that cover the surface of the eyeball and the underside of the eyelid. Allergic eczema. This is an allergic rash that is usually not caused by skin contact with an allergen. It's usually associated with hay fever of asthma. Hives. These are skin reactions that appear as itchy swellings and can occur on any part of the body. Allergic shock. This is a life-threatening allergic reaction that can affect a number of organs at the same time. This response typically occurs when a food allergen is eaten or when a sufferer is stung by a bee. Continue reading below to find out more information about the causes of allergies during menopause. Many women with gluten allergies have lingering questions concerning the implications of such. Discover more frequently asked questions and their answers here to finally start living without doubts. Allergies are understandably a great concern for most women: they are very common, but rarely effectively treated. Avoiding the triggers can be very challenging with certain types of allergies, such as dust mite or pollen allergy, because they are commonly present in our everyday life. The allergens that can potentially trigger an allergic reaction are abundant and omnipresent, which makes diagnosing allergies quite challenging. Fortunately, allergy tests, such as skin patch or blood test, are widely available and have become valuable in identifying the substances responsible for causing allergies. Allergies stem from reactions the immune system provokes in the body. Different cells in the immune system are influenced by estrogen. 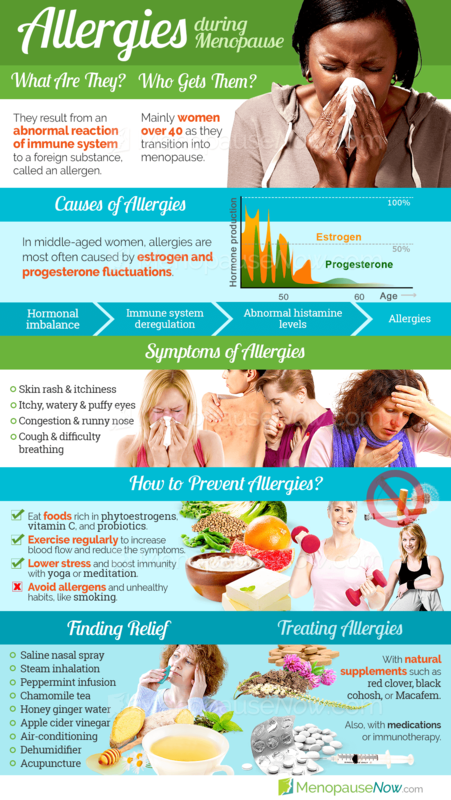 Whenever hormonal fluctuations occur, the immune system can be impacted and make a woman more prone to allergies. If neither parent has allergies, the chance that a child will have allergies is about 12%. If one parent is allergic, the risk increases to 30 - 50%, and if both are allergic, the risk is greater than 60 - 80%. As menopause approaches, a woman's body prepares to cease menstruation permanently. In order to prepare for this, hormone production drastically decreases. Hormone level fluctuations can have a significant impact on both the incidence of allergies and the severity of allergy symptoms. Although the mechanisms are not always well understood, changes in hormone levels are frequently associated with the development of allergies or changes in allergy symptoms, particularly hay fever, asthma, and dermatitis. Along with hormonal causes of allergies, other factors can increase susceptibility to allergies or intensify symptoms. Some of those factors include diet, certain medications, and stress. Continue reading to learn more about the treatment options available for allergies during menopause. Food intolerance and allergy are often confused as they share some of the symptoms.But the mechanism behind our body's reaction to certain foods known to cause intolerance or allergy,like eggs or nuts, are substantially different in both cases, so it is important to learn how to know them apart. The causes of allergies are numerous, but some are more common than others. This article focuses on the causes of allergies that are reasonably uncommon, so they could possibly be leading to your allergic reactions without your knowledge. Fortunately, once the allergen is pinpointed, it is reasonably easy to avoid. Fortunately, there are numerous treatment options available for women who are suffering from allergies. When managing symptoms, it is important to begin with the least risky treatment options first. This means that lifestyle changes are the best place to begin to search for alleviation from allergies. For instance, try shutting the windows of the house to prevent pollen from entering, or get an air filter that can drastically reduce allergic particles in the air. These are just a couple examples of altering habits around the house to stymie allergies. Typically, combining lifestyle changes and alternative medicine will produce the best outcome. Alternative medicine can be different herbs and supplements or even techniques like aromatherapy, though some methods are more effective than others. When seeking out alternative medicine, keep in mind that allergies are associated with hormones and look for a treatment that balances hormone levels, as this will go a long way in subduing allergic reactions. Finally, if symptoms still persist even after implementing the first two approaches, there are multitudes of different medications or desensitization treatment that can be explored. For instance, allergy shots, prescribed drugs, or over-the-counter medications can bring relief. However, this approach generally comes with the most side effects. Click on the following link to learn specific treatments for allergies, which begin with lifestyle changes, move onto alternative medicine, and finally, if those options don't seem to help, medications. The most effective treatments for allergies typically combine lifestyle changes and alternative medicine. Food allergies are unpleasant at best and at worst can even be dangerous. This article aims to serve as a guide to the most common food allergies and provides information about who is most likely to get them and what kind of reactions they are likely to elicit. Food allergies can be hard to cope with when visiting a restaurant. However, there are ways to deal with it. This article describes five things you can do to ensure a smoother experiencing when dining out, including researching the restaurant, asking questions, and avoiding prime time. 07/06/2018 Seasonal allergies are difficult to deal with. Limiting outdoor exposure is not always easy, and allergy medications can be effective in relieving the symptoms, but often come with various side effects. Finding the right treatment is based on a trial-and-error approach, but it can help you manage your allergies better. 04/20/2016 If you suffer from eye allergies, you will understand how painful and distressing they can be, and you are probably seeking some safe and effective solutions. This article discusses eye allergies in more detail and gives you ideas on how you can prevent them. Nasal Sprays for Allergies: Are They the Solution? 04/01/2016 Nasal allergies have a variety of symptoms, and to control these, many sufferers reach for products like decongestant nasal sprays. This article discusses whether or not nasal sprays for allergies really are the best solution, focusing on the pros and cons and offering alternative solutions. 12/15/2015 Allergies can cause feelings of fatigue, so it is possible for the two conditions to come together. However, more commonly, they do not and have their own range of symptoms. This article looks at the most common symptoms of allergies and fatigue, as well as their respective causes.